You love the look of hardwood flooring, but you don’t like the cost. If you want the look without spending all the money, vinyl plank flooring is perfect for you. These planks have a natural grain design that looks just like real wood, but they cost much less and are easier to install. Plus, vinyl has some benefits that you can’t get with wood. With so many benefits, our Denver vinyl plank flooring experts have been busy installing this flooring all around the city. Vinyl plank flooring is the fastest growing flooring option for a reason: People just can’t get over all the benefits. When people find out what this flooring has to offer, they can’t help but schedule an estimate with Carpet In Motion. Vinyl plank flooring is so easy to install that it can even be installed over existing floors; that is a huge cost saver. Imagine what you would have to spend to rip up old tile. That could be hundreds upon hundreds of dollars. Instead of worrying about that, you can put the vinyl right on top of your floor. Even if you choose to have your old floor removed, vinyl planks are still easier to install than other types of flooring. These planks snap together easily, so your Denver vinyl plank installation team can get in and out in no time. Easy installation means affordable installation, but that’s not all: The cost of the vinyl planks is also more affordable than other types of flooring. This is your chance to get luxurious-looking flooring at a price that you can afford. 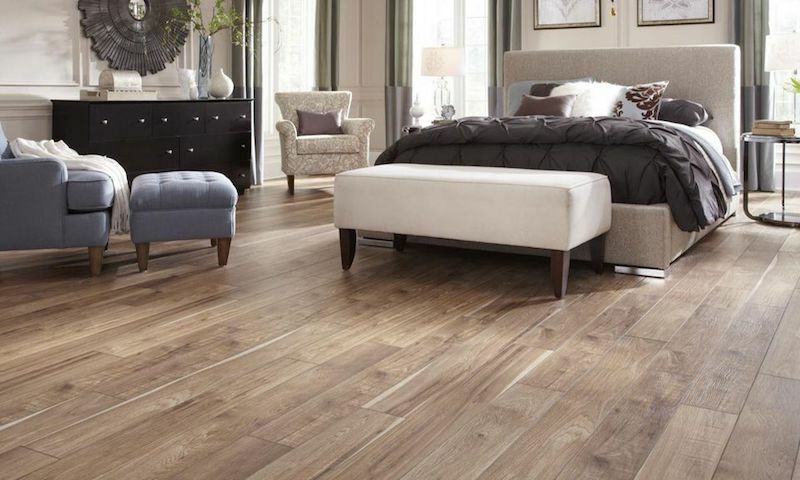 You want a floor that’s comfortable to walk on, and vinyl planks deliver. Your Denver vinyl plank installation team will put insulation underneath the planks which will mask sound and make every step you take as comfortable as the last one. You will feel like you’re floating on air when walking on vinyl. Are you worried about maintaining a new floor? You want it to look like new from year to year, so vinyl planks might be perfect for you. Vinyl has a scratch-resistant surface, so your pets and kids can run around the floor without any worries. Plus, it’s really simple to clean – just use some flooring solution on it to make it sparkle – even if you have a ton of foot traffic. If you have wood flooring, you have to worry about water damage; that’s not true with vinyl planks. This type of flooring is waterproof, so put it in your kitchen or laundry room without fear. It’s not just great for those rooms, either. It’s so gorgeous that it also looks great in a living room. Vinyl planks would be a great addition to your home. Take the next step in making that happen by contacting Carpet in Motion today. We will get a technician out to your home, and he or she will help you make a flooring decision. Then, you will get your new floor in no time at all.